Diller Scofidio + Renfro has completed the first stage of its renovation of New York's Museum of Modern Art, and has revealed details of its plans to extend into Jean Nouvel's 53W53 residential tower. The US studio is working with global firm Gensler on the project that will increase MoMA's gallery space by 30 per cent, as well as improving circulation and offering improved connections to its surroundings in Midtown Manhattan. The first phase – the renovation of the east wing in the museum's Ronald S and Jo Carole Lauder Building – opens to the public this week. When this refurbishment began in February last year, the museum closed the architecture and design galleries, raising questions about whether the extension would provide dedicated spaces for these parts of MoMA's collections. But it later issued a letter that it would not be scrapping these programmes entirely. Instead, the architects have reconfigured 15,000 square feet of the second floor into two "loft-like" exhibition spaces for multi-disciplinary showcases of its architecture ad design collections. "The gallery space that was there is reconfigured, we removed the walls, we made it really clean, changed the floor and opened it up into a big loft space," said Elizabeth Diller of Diller Scofidio + Renfro at a press conference unveiling the design yesterday. In other instances, different mediums will be shown in rotation or in special exhibitions like the major Frank Lloyd Wright retrospective that opens on 12 June. On the floor below this, the architects have made a new lounge with views of the Philip Johnson-designed sculpture garden, considered a masterwork of landscape architecture and a key feature of the new configuration. "All the way up and down the building, the garden is brought in to the experience," said Diller. A new museum and book shop is placed alongside the lounge, while the cafe on this floor has been reconfigured and set adjacent to an espresso bar and library. The Bauhaus staircase now extends down to the ground floor, with the addition of new steps made of Grand Antique marble from the Arege region in France. "It's not really a reconstruction because the stair that was there was very small and windy," explained Diller. "But we basically took the contours of the plan of the existing stair and brought it all the way down." The staircase offers a link to the gallery spaces and the ground-floor lobby on Ronald S and Jo Carole Lauder Building – the museum's original entrance. It will again function as the main entrance as the next phase starts this week with the reconfiguration of the main lobby into a double-height space. This will kick-start the two-year extension of the west wing, which includes the addition of a suite of ground-level galleries. These free-admission galleries will have windows facing onto the street. A double-height Projects Room that Diller said will "pretty much take anything" will be overlooked from the first floor, while other spaces will be designed for more specific showcases. This includes a contemporary design gallery and a double-height studio for media, performance and film. Galleries on the first, third and fourth floor are set to extend through the Jean Nouvel-designed 53W53 building, providing an additional 11,500- square feet on each level. Circulation throughout the museum will also be improved. 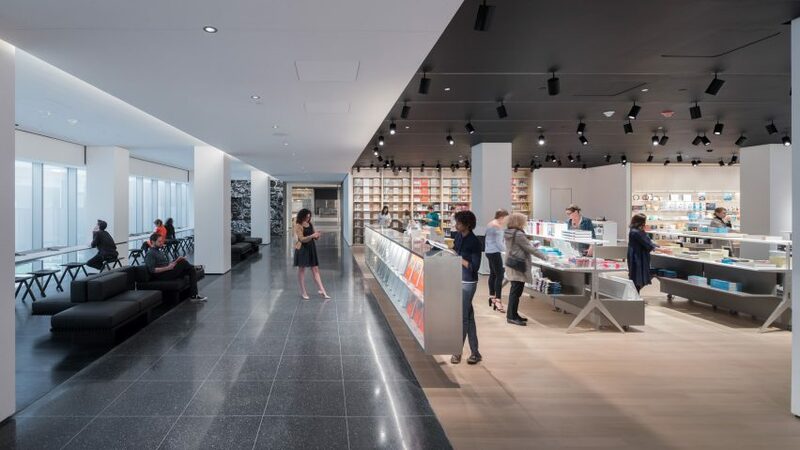 The MoMA Design and Book Store down will be lowered down one level to provide a link to the galleries in the renovated east wing. Each exhibition space will be well connected to the next, but will be tailored to meet the need of specific displays. "Altogether these galleries create a network that feels like it could be contiguous," said Diller. "The curators are able to make contiguous shows across floor plates but at the same time each of these spaces are marked differently so its theme and variation architecturally." There will also be a new lounge on the sixth-floor, opening to a terrace. The extension is slated for completion 2019, while the main entrance on 53rd Street will be closed from 4 June 2017 and is expected to reopen in October 2017. Diller Scofidio + Renfro – which ranked 68th on Dezeen Hot List 2016 – intend that the completed overhaul will reflect aspects of the museum's major expansion, which was designed by the Japanese architect Yoshio Taniguchi and completed in 2004. The New York City firm's project, however, has proved controversial after it triggered the destruction of Tod Williams and Billie Tsien's Museum of American Folk Art and then was later forced to be scaled back.